At times it seems like the world of online poker is inundated with novelty Sit & Go games; and it´s quite understandable to be underwhelmed with the news of another one. However, BetOnline Poker´s new Sit & Go Madness games are actually quite good, and they are well worth investigating if you fancy something different from three-handed, hyper-turbo Sit & Go games with random prize pools. The Sit & Go Madness games are themed on the March Madness basketball tournament inasmuch as they consist of player-on-player heads-up matches from which the winner progresses to the next round. However, players will not have to wait until April to get to the Final, as there are restrictions on how many players can enter each game and – in most cases – games will finish within 30 minutes. Sit & Go Madness games are available in 4-player, 8-player, 16-player, and 32-player formats at up to four different buy-in levels. So, in a 4-player game there will only be two rounds of action (effectively a semi-final and a Final), and in a 32-player game there will be five rounds of action. In 4-player and 8-player games, only the top two players will win a share of the prize pool, while in 16-player and 32-player games, the top four players will win a prize. In an additional twist, half the buy-in (after the fee has been deducted) will be a bounty of each players head. Therefore, if you enter a 32-player Sit & Go Madness game and win your first round match, you will win nearly half your buy-in back immediately. By the time you have progressed to the Final of a 32-player game, you will have won nearly double your buy-in excluding your share of the prize pool; and, if you are successful in the Final, in addition to receiving your opponent´s bounty, you also keep your own. If you are tempted to give the Sit & Go Madness games a try, they go live in the BetOnline Poker client today and will continue to run until April 8th. 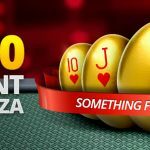 While you are in the BetOnline Poker client, you might also want to try out two other new Sit & Go games launched recently by the site – Progressive Jackpot Sit & Gos and Flip Sit & Gos. Progressive Jackpot Sit & Gos are much the same as other sites´ hyper-turbo Sit & Go games with random prize pools except that 2% of the buy-in is allocated to a progressive jackpot pool. When the jackpot prize is randomly spun, all three players will win a share of the progressive jackpot (1st: 65%, 2nd: 25%, 3rd: 10%), which could be as high as $150,000. Flip Sit & Go games don´t have the progressive jackpot element but differ from other sites´ hyper-turbo Sit & Go games inasmuch as all three players are all-in every hand until a winner is determined. 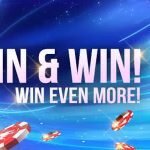 The distribution of random prizes is also slightly different – starting at 1.5 times the buy-in and going up to 5,000 times the buy-in – with a higher percentage of mid-range prizes being drawn. 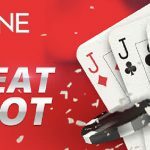 One final thought is that, if you are not already playing at BetOnline Poker, the new range of Sit & Go games offer a better-than-average online poker experience while you earn points to clear the BetOnline Poker bonus. 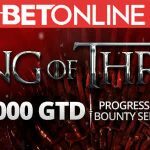 Full details of the bonus, the clearing requirements, and other features of the site can be found in our review of BetOnline Poker.